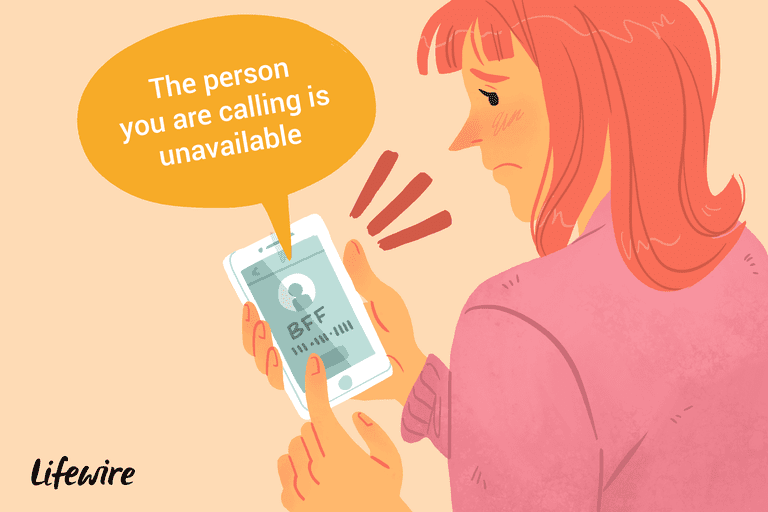 When someone blocks your number, there are a few ways to tell — including unusual messages and how quickly your call transfers to voicemail. Let’s look at the clues that indicate your number is blocked and what you can do about it. Because determining if you’ve been blocked isn’t necessarily straight-forward, remember the best way to find out is to ask the person directly. If that's not something you can or want to do, we have some clues to help you determine if you are blocked. Depending on whether they’ve blocked your number on their phone or with their wireless carrier, the clues of a blocked number will differ. Also, other factors can produce similar results, such as a cell tower down, their phone is turned off or has a dead battery, or they have Do Not Disturb turned on. Dust off your detective skills and let’s examine the evidence. If you call once a day for two or three days and get the same message each time, the evidence shows you’ve been blocked. If you hear only one ring or no ring at all before your call goes to voicemail, this is a good indication you’re blocked. In this case, the person has used the number blocking feature on their phone. If you call once a day for a few days and get the same result each time, that is strong evidence your number is blocked. If you hear three to five rings before your call routes to voicemail, you’re probably not blocked (yet), however, the person is declining your calls or ignoring them. Exceptions: If the person you’re calling has the Do Not Disturb feature turned on, your call – and everyone else’s – will be quickly routed to voicemail. You will also get this result when their phone battery is dead or their phone is turned off. Wait a day or two before calling again to see if you get the same result. If you get a busy signal or fast busy signal before your call is dropped, it’s possible your number is blocked through their wireless carrier. If test calls a few days in a row have the same result, consider it evidence you’ve been blocked. Of the different clues indicating a blocked number, this one is the least common though some carriers do still use it. A far more likely reason for this result is that either your carrier or theirs is experiencing technical difficulties. To verify, call someone else — particularly if they have the same carrier as the person you’re trying to reach — and see if the call goes through. While you can’t do anything to have the block on your number removed with their wireless carrier or from their phone, there are a couple of ways to get through or verify your number is, indeed, blocked. If you try one of the options below and get a different result or clue from the list above (provided they don’t answer), take it as evidence that you’ve been blocked. Use *67 to hide your number from their caller ID when you call. Hide your number using the settings in your phone to turn off your caller ID information on outgoing calls. Call them from a friend’s phone or have a friend you trust call them for you. Contact them directly through social media or email and ask if they’ve blocked you. Repeatedly contacting someone who has taken steps to cut contact, such as blocking your number, could result in accusations of harassment or stalking and serious legal consequences.